When Andy Warhol and Philip Pearlstein's sublease was up, they found another apartment through the New York Times classifieds - a large second floor room at 323 W. 21st Street which they rented from the dancer Franziska Marie Boas who shared the space with her friend Jan Gay and their large sheepdog named "Name. "(1) Boas was the daughter of the Prussian-born anthropologist, Franz Boas, who was the first professor of anthropology at Columbia University - a position he held for 37 years. In 1927 he had written a book, Primitive Art, which proposed a theory of dance as an emotional outlet and challenged the racial bias of the then prevalent theories of physical anthropology. 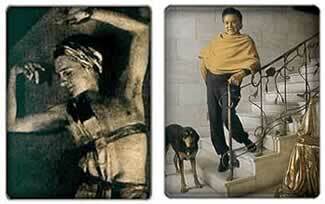 (2) His daughter, Franziska, also challenged racial bias by organizing multi-racial dance groups and classes. From 1933 to 1950 she ran the Boas School of Dance, with sessions held at the 21st Street apartment. She had divided the large room with a proscenium arch with Warhol and Pearlstein on one side of the arch and her dance classes on the other side. She was particularly keen on improvisational dance and sometimes invited artists to sketch the dancers while they improvised although it is not known whether Warhol participated in any of these sessions. In April 1950 Boas was evicted from the commercially zoned property and Warhol and Pearlstein were, again, forced to move. They went their separate ways. In August 1950, Pearlstein married an ex-classmate from Carnegie Tech, Dorothy Cantor, and Warhol was part of the wedding party. One of the first places that Philip and Dorothy lived in was an apartment they got from the artist Lester Johnson on East 4th Street between Avenues A and B. (3) Pearlstein returned to school, studying for a Master of Arts degree at New York University's Institute of Fine Arts with a thesis on the Dada artists, Francis Picabia and Marcel Duchamp. (4) By the time of Pearlstein's wedding Warhol was living at 74 West 103rd Street. One of Finsilver's dates, Robert Fleisher, later recalled his own impressions of Warhol and the other people who lived at 103rd Street. Groell's apartment was located at 24th Street between First and Second Avenue. He remembered Warhol adopting a novel approach when phoning art directors for work. Groell heard Warhol begin his telephone conversations with "Hello, I'm just sitting on my bed here, playing with my yo-yo," and joking with potential employers before asking for commissions: "I planted some bird seed in the park yesterday... would you like to order a bird? And do you have any work for me? "(13) By adopting such novel approaches Warhol guaranteed that his name would be remembered by art directors in the highly competitive field of commercial illustration. By June 1951, Warhol was living in another apartment registered in Victor Reilly's name at 218 East 75th Street. (14) By 1952, Warhol was living next door at 216 East 75th Street. It was while he was living on 75th Street that his mother, Julia, moved in with him from Pittsburgh. She would continue to live with Warhol until the autumn of 1970 when she returned to Pittsburgh for health reasons. (15) In June 1952 Warhol had his first exhibition in New York at the Hugo Gallery. Andy Warhol's first pre-Pop exhibition featured a series of drawings inspired by Truman Capote's short stories. 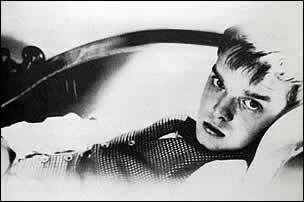 Capote's first book, Other Voices, Other Rooms was published in 1948 when Warhol was still at college. 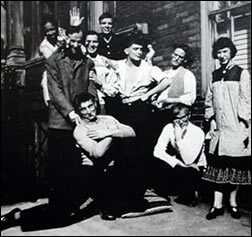 Two months prior to Warhol's exhibit at the Hugo, Capote's play, The Grass Harp, had premiered on Broadway at the Martin Beck Theater, with sets and costumes designed by Cecil Beaton. Truman Capote: "You said something to me that really startled me when you came to the house today... You said that my mother telephoned you. I was absolutely startled. Really startled." Andy Warhol: "You were? Why?" Truman Capote: "Because my mother really was an alcoholic." Andy Warhol: "But I met your mother." Truman Capote: "I know you met my mother. But my mother was a very ill woman, and a total alcoholic... she was an alcoholic when you met her. She had been an alcoholic since I was 16, so she was an alcoholic when you met her... she had this sort of sweet thing, and then suddenly she'd - well you know she committed suicide." Andy Warhol: "She did? Oh, I didn't know that. I thought she just got sick." It is interesting to note that neither Andy nor Truman mention meeting each other prior to the death of Capote's mother, Nina, who committed suicide in 1954. (19) In the Rolling Stone interview, Warhol says that he met Capote's mother but does not claim to have met Truman during the same period. Yet several Warhol biographers have maintained that they did meet each other during Warhol's early years in New York. The exhibition of Warhol's Capote inspired drawings ran at the Hugo Gallery from June 16 - July 3, 1952. The Hugo had been founded in 1944 by Robert Rothschild, Elizabeth Arden and Maria Hugo who was married to author Victor Hugo's grandson. In 1947 the gallery had hosted Bloodflames, a show of Surrealists which included work by Gorky and Matta. At the time of Warhol's show, the director of the gallery was Alexandre Iolas, assisted by David Mann, the gallery's manager. Iolas would also be responsible for Warhol's last exhibition when, in January 1987, he showed Warhol's Last Supper paintings in Milan at the Palazzo delle Stelline, across from the Church of Santa Maria della Grazie which housed Leonardo's Last Supper. Iolas had commissioned Warhol to do his version of Leonardo's painting in early 1986. Iolas, born in Alexandria, Egypt in 1908, came from a dance background. After studying ballet in Berlin he fled to Paris during Hitler's rise to power in the 1930s. In Paris he continued to study dance and socialized with artists such as Jean Cocteau, Georges Braque, Pablo Picasso, Max Ernst and Man Ray. After moving to New York he was able to draw on these artistic contacts when he quit dancing in order to concentrate on his career as an art dealer. After working at the Hugo gallery, he founded the Jackson-Iolas Gallery in 1955 with former dancer, Brooks Jackson and later opened galleries in Paris, Milan, Madrid and Mexico City. He died of AIDs in June 1987 - just four months after Warhol had died in the same hospital in New York.